The river is beginning to open up at the base here in Red Lake, Ontario. If you haven’t booked a fly in fishing trip we still have a few spots left. 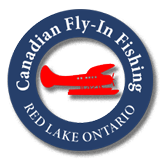 Give us a call at 1-800-445-4624 or email josh@canadianflyinfishing.ca to inquire about open dates. We have a few last openings on Thicketwood, Knox, and Mimi. Our outpost cabins are located in the remote Canadian wilderness and provide the opportunity for a world class trophy fishing experience. Catch countless walleyes and northern pike on one of our fly in access only lakes. Enjoy cabins equipped with solar power systems, running water (with on demand hot water units), and kitchens equipped with modern appliances. Enjoy the great outdoors without giving up modern comforts. If you are looking to book a fly in fishing trip for the 2019 season call now 1-800-445-4624 or email josh@canadianflyinfishing.ca to book the fishing trip of a lifetime this summer.